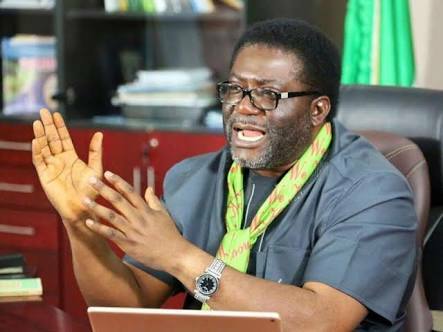 The Deputy Governor of Imo State, Eze Madumere, has released a statement to counter the allegations leveled against him by the Imo State House of Assembly. 1. Absence without official reason or permission duly obtained from office for a period of three (3) months. b. Failure/refusal to attend constitutional mandated proceedings of the State Security Council. 4. Concealment of felonious conduct affecting the presentation of self as eligible candidate of Office of Deputy Governor, Imo State, having been convicted and imprisoned for theft in the United States of America. 1. The first claim of absence is rather an old ploy of calling a dog a bad name to hang it. Fortunately, the Deputy Governor of Imo State, Prince Eze Madumere is an administrator per excellence who does joke with his duties especially his constitutional responsibilities. As such he has never absconded from office the period so claimed. He is constitutionally saddled with the responsibilities of superintending Boundary commission. By our records, the Deputy Governor of Imo State has never abdicated from such responsibility or any other . People of Umuoma of Ihitte-Uboma local government, Ihube of Okigwe local government among others can testify of the Deputy Governor’s sagacity in crises resolution with particular reference to April 11, April 16 2018. His Excellency also participated in one day retreat for Stakeholders in the management of Nigeria boundaries, which held at the Airforce Conference Center, Abuja in the company of the Surveyor General of the State and the Principal Secretary to the Deputy Governor on May 7, 2018. 2. A. Refusal to attend Constitutional mandated proceedings of the State Executive Council is also one of the allegations that cannot stand any administrative procedure. There are laid down procedures through a Deputy Governor or any member of the executive Council can be invited for Executive council meeting. We hereby state that the Deputy Governor has never been invited for such meetings through either a memo or any official notices and thereby cannot stand against the deputy governor. B. As stated above, the Deputy Governor can only attend a meeting he is officially invited to and he is no spirit to know when meetings are slated except he is duly informed. 3. Refusal to attend, and to hold meetings with the Governor is to say the least another exercise in triviality as the Deputy Governor cannot force himself on the Governor especially when he has been tagged a pariah in the Government circle. We state here that Governor Okorocha has never created such opportunity to meet with the Deputy Governor to discuss the programmes and activities of the Government other than the once we embarrassingly hear by the road side and other sources. To this extent, where the Deputy Governor’s inputs are needed, there are right procedures through which he could be reached either through his Principle secretary and other principal officers or directly to the Deputy Governor. 4. The most embarrassing among the spurious allegations is the annoying allegation of concealment of felonious conduct affecting the presentation of self as eligible candidate of office of Deputy Governor of Imo State. This is not only astonishing but an extreme show of lack of due diligence. The Deputy Governor of Imo State, Prince Eze Madumere has never been convicted of any civil matter let alone a criminal matter. We are pained to state that two times the Deputy Governor had to go through the pains of losing his freedom in detention were all in the course of saving Owelle Rochas Okorocha from public disgrace. He rather had to carry Okorocha’s cross and bore his shame. It will be recalled that Prince Madumere shortly after Achike Udenwa’s victory at the polls in 1999 where he had to face contempt of Court for failure to make it to the court. He was in detention in the United States for about one month all because he was delayed by Governor Okorocha. To the glory of God, Prince Madumere was acquitted of all charges. We also challenge the members of the House of Assembly to produce the verdicts of the court that convicted Prince Madumere. The second time he had to stoop that Governor Okorocha may be spared of the humiliation of getting incarcerated, Prince Madumere again yielded and was detained for almost two months on phony charges, which he also been absolved of all charges.